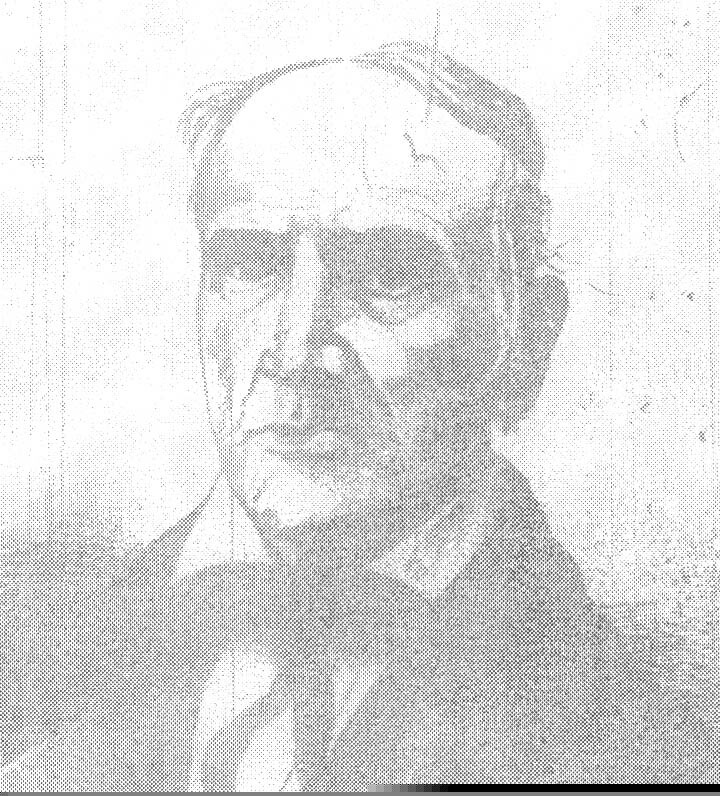 Gilman Bryant, 1784-1859 – one of my ancestors who moved westward from Vermont to Ohio. Built around 1812 by Gilman Bryant, this home is perhaps the oldest standing brick residential property in Mount Vernon. Bryant arrived in Mount Vernon in 1807, two years after Mount Vernon was officially founded and one year before Knox County was created. It did not take long before Bryant became one of the wealthiest merchants in the area. 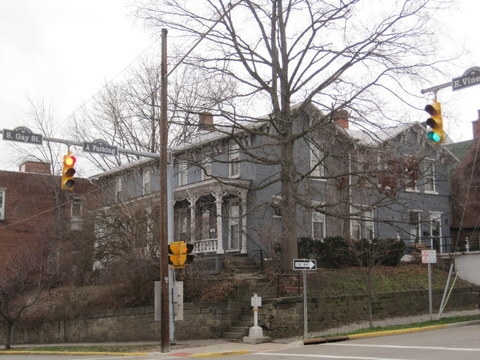 Sitting high atop an embankment on the corner of East Vine and South Gay Street, this home provides an interesting spectacle. Clearly of early construction, with typical Federal massing, the house was altered several times throughout its existence as new architectural styles became fashionable. Most prominent is the addition of rear a wing along the Gay Street side. This wing is nearly identical to the original home, giving the house a flattened “M” shape at the Gay Street view. 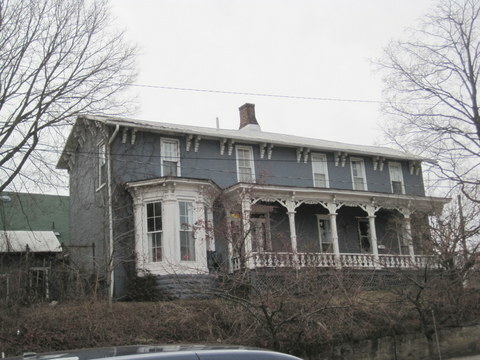 Later alterations to both buildings include the addition of cornice paired brackets in the Italianate tradition, as well as a large Italianate bay window and full-length front porch along the main Vine Street facade. The scroll-work between the delicate columns lining the front porch are more reminiscent of Gothic Revival detailing than Italianate. The transom over the front door may be original, although the sidelights were most likely a later addition, and is more in line with Greek Revival architecture. KNOX COUNTY was named for Gen. Henry KNOX, a native of Boston, General in the war of the Revolution, and Secretary of War in Washington’s administration. It was formed from Fairfield, March 1, 1808. The north and east parts are hilly; the central, west and south parts, undulating or level. The bottom lands of the streams are very rich, particularly those of Vernon River, which stream affords abundance of water-power. Area about 540 square miles. In 1887 the acres cultivated were 1,141,915; in pasture, 19,622; woodland, 55,262; lying waste, 714; produced in wheat, 452,889 bushels; broom-corn, 4,425 pounds brush; meadow hay, 33,228 tons; clover-seed, 5,291 bushels; flax-seed, 5,321; potatoes, 59,562; tobacco, 475 pounds; butter, 503,720; cheese, 200; sorghum, 436 gallons; maple syrup, 14,832; honey, 3,463 pounds; eggs, 550,061 dozen; grapes, 19,620 pounds; wine, 57 gallons; sweet potatoes, 76 bushels; apples, 9,915; peaches, 13,479; pears, 685; wool, 772,829 pounds; milch cows owned, 5,831. School census, 1888, 7,897; teachers, 283. Miles of railroad rack, 73. When the settlers first came, there were two wells, only a few rods apart, on the south bank of Vernon river, on the edge of the town, the origin of which remains unknown. They were built of neatly hammered stone, laid in regular masonry, and had the appearance of being overgrown with moss. Nearby was a salt lick, at which the Indians had been accustomed to encamp. Almost immediately after the first settlement, all traces of the wells were obliterated, as was supposed, by the Indians. A similar well was later brought to light, a mile and a half distant, by the plow of Philip COSNER, while plowing in a newly cleared piece of forest land. It was covered with poles and earth, and was about thirty feet deep. At an early day the Indians, in great numbers, came to Mount Vernon to trade. They encamped on the riverbank and brought large quantities of furs and cranberries to dispose of for goods. The whites of the present day might take some beneficial hints from their method of trading at the store in this place. They walked in deliberately and seated themselves, upon which the merchant presented each with a small piece of tobacco. Having lighted their pipes, they returned the residue to their pouches. These were made of a whole mink-skin, dressed with the hair on, with a slit cut in the throat as an opening. In it they kept, also, some kinnickinnick bark, orsumach, which they always smoked with their tobacco, in the proportion of about three of the former to one of the latter. After smoking and talking a while together, one only at a time arose, went to the counter, and taking up a yardstick, pointed to the first article he desired, and inquired the price. The questions were in this manner: “How many bucks-skins for a shirt-pattern?” or “cloth for leggings?” etc. ; according to their skin currency. A muskrat skin was equal to a quarter of a dollar; a raccoon-skin, a third of a dollar; a doe-skin, half a dollar, and a buck-skin, “the almighty dollar.” The Indian, learning the price of an article, paid for it by picking out and handing over the skins, proceeding to purchase the second , when he repeated the process, and so on through the whole, paying for everything as he went on, and never waiting for that purpose until he had finished. While the first Indian was trading, the others looked uninterruptedly on, and when he was through, another took his place, and so on, in rotation, until all had traded. No one desired to trade before his turn, and all observed a proper decorum, and never attempted to “beat down,” but, if dissatisfied with the price, passed on to the next article. They were cautious not to trade while intoxicated; but usually preserved some of their skins to buy liquor, and ended their visit with a frolic. After Mount Vernon was laid out, the settlers from the region roundabout were unaccustomed to come into town on Saturdays, to clear the stumps out of the streets. Early in the afternoon they quit work, and grew jolly over a large kettle of “stew.” This was made as follows: first, a huge kettle of gallons’ capacity, was placed upon the ground, resting upon three stones, and a fire kindled under it. In it was put two or three buckets of water, a few pounds of maple sugar, a few ounces of allspice, which had been pounded in a rag, a pound of butter, and, finally, two or three gallons of whiskey. When boiled, the stew was taken off, a circle was formed around, and the men helped themselves liberally, with tin cups, to the liquor, told hunting stories, wrestled, ran, hopped and jumped, engaged in foot races, shot at mark for goods or tobacco purchased at the store, and occasionally enlivened the scene by a fight. Upon the organization of the county, there was a spirit of rivalry as to which should be the county seat, Mount Vernon or Clinton, a town laid out a mile and a half north, by Samuel Smith – than a place of the most population, now among the “things that were.” The commissioners appointed to locate the seat of justice first entered Mount Vernon, and were received with the best cheer, at the log tavern of Mr. BUTLER. To impress them with an idea of the public spirit of the place, the people were very busy at the moment of their entrance and during their stay, at work, all with their coats off, grubbing the streets. As they left for Clinton, all quitted their labor, not “of love;” and some rowdies, who dwelt in cabins scattered round about in the woods, away from the town, left the crowd, and stealing ahead of the commissioners, all arrived at Clinton first. On the arrival of the others at that place, these fellows pretended to be in a state not conformable to temperance principles, ran against the commissioners, and by their rude and boisterous conduct, so disgusted the worthy officials as to the apparent morals of the inhabitants of Clinton, that that they returned and made known their determination that Mount Vernon should be the favorite spot. That night there were great rejoicings in town. Bonfires were kindled, stew made and drank, and live trees split with gunpowder. The first settler north of Mount Vernon was Nathaniel M. YOUNG, from Pennsylvania, who, in 1803, built a cabin on the South fork of Vernon river, three miles west of Fredericktown. Mr. YOUNG and his neighbors being much troubled with wolves, got together and made a written agreement to give nine bushels of corn for every wolf’s scalp. In the winter of 1805-6, Mr. YOUNG, John LEWIS and James BRYANT caught forty-one wolves, in steel traps and pens. Wolf-pens were about six feet long, four wide and three high, formed like a huge square box, of small logs, and floored with puncheons. The lid, also of puncheons, was very heavy, and moved by an axle at one end, made of a small, round stick. The trap was set by a figure four, with any kind of meat except that of wolf’s, the animals being fonder of any other than their own. On gnawing the meat, the lid fell and enclosed the unamiable native. Often to have sport for the dogs, they pulled out the legs of a wolf through the crevices of the logs, hamstrung, and then let him loose, upon which the dogs sprang upon him, while he, crippled by the operation, made but an ineffectual resistance. In the adjoining county of Delaware, a man, somewhat advanced in years, went into a wolf trap to render the adjustment of the spring more delicate, when the trap sprung upon him, and, knocking him flat on his face, securely caught him as was ever any of wolf species. He was unable to lift up the lid, and several miles from any house. There he lay all one day and night, and would have perished had not a passing hunter heard his groans and relieved him from his peril. Mount Vernon in 1846. – Mount Vernon, the county seat, is forty-five miles northeast of Columbus. It is beautifully situated on ground up slightly ascending from Vernon river. The town is compactly and substantially built, and some of the dwellings elegant. Main, the principal business street, is about a mile in length, on which are many brick blocks, three stories in height. The view was taken in this street at the southern extremity of the public square, looking north. On the left is shown the market and courthouse; on the right the Episcopal Church, an elegant stone edifice, and in the center the lower of the Old-School Presbyterian Church and the jail. This flourishing town contains two Presbyterian, two Methodist, one Baptist, one Lutheran, one Catholic and one Episcopal church; twenty dry-goods, six grocery, two hardware, three apothecary and two book-stores; one fulling, four grist and five saw-mills; three newspaper printing-offices, and had, in 1840, 2,363 inhabitants, and has now over 3,000. The railroad, constructing from Sandusky City to Columbus, will connect his place with those. – Old Edition. Manufacturers and Employees. – C. A. & C. R. R. Shops, railroad repairs, 125 hands; E. L. BLACK, piles and castings, 4; the Cooper Manufacturing Co., engines and saw-mills, 45; Mount Vernon Bridge Co., iron bridges, 100; Kokosing Flour Mills, flour, etc., 20; Eagle Mills, flour; S. H. JACKSON, carriages and buggies; Mount Vernon Linseed Oil Co.; C. & G. COOPER, saw-mills, etc., 190; Mount Vernon steam laundry, laundrying, 10. – State Report, 1888. Population, 1880, 5,249. School census, 1888, 1,100; J. A. SHAWAN, school superintendent (and from 1883 to 1889, when he was given the same position in Columbus). Capital invested in industrial establishments, $1,009,150; the value of annual product, $1,326,700. – Ohio Labor Statistics, 1887. Census, 1890, 6,027. The judgment of castigation was executed upon the public square of Mount Vernon, shortly after the adjournment of court, in presence of all the people. Silas BROWN was the sheriff, and it fell to his lot as such to serve the “legal process” upon the body of William HEDRICK. There was a small, leaning, hickory tree upon the east side of the public square, between the present Norton building (now occupied by Dr. Israel GREEN, druggist) and High street, and a little south of where the jail was afterwards built, and this tree bent in such a way that a man could walk around under it. To this delectable spot the culprit was taken, and his hands stretched up over his head and tied to the tree, and the stripes were applied by the sheriff to his naked back. He was struck forty times with a heavy rawhide whip. The first few blows with the rawhide were across the kidneys. Mr. BRYANT, one of the bystanders, at once called out to the sheriff to whip him elsewhere; that was no place to whip a man; he should strike higher up; and the rest of the lashes were applied across the shoulders. The criminal sobbed and cried piteously, and when released went off weeping and groaning. In many places the skin was cut and broken, and the blood oozed out, making a pitiable spectacle. And yet, such was the feeling against him, but few seemed to sympathize with the scourged. As he started off he said to the spectators: “You should not blame me for this, for it was not my fault.” Bob WALKER replied: “No, you wouldn’t have stood up and been whipped that way, if you could have helped it.” At this prompt retort to HEDRICKS’ explanation or apology, the crowd laughed uproariously. Gambier in 1846. -Five miles east of Mount Vernon, on a beautiful, healthy, and elevated ridge, encompassed on three sides by the Vernon River, is the village of Gambier, so named from Lord GAMBIER, and widely known as the seat of Kenyon College. This town, exclusive of the college, contains about 200 inhabitants. It was laid out under the auspices of the venerable Bishop CHASE, in July, 1826, in the center of a 4000-acre tract, belonging to Kenyon College. This institution was then founded, with funds obtained by Bishop CHASE in England, and named after Lord KENYON, one of its principal benefactors. It was first chartered as a theological seminary. It is richly endowed, having 8,000 acres of land and its property is valued at $100,000. The college proper has about 50 students; the theological seminary about twenty; the senior grammar school about twenty, and Milnor Hall, an institute for boys, about twenty-five. In the various libraries are near 10,000 volumes.